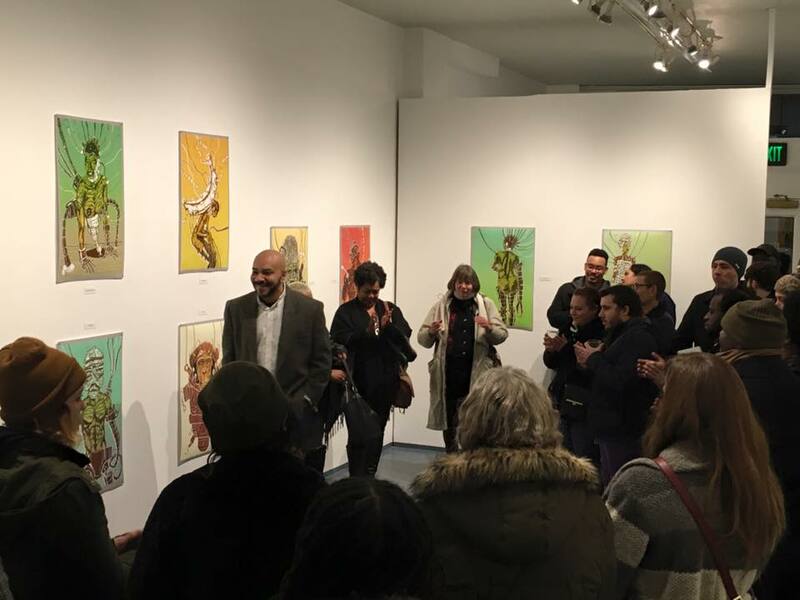 John Jennings gives an artist talk during the opening of MATTERZ of the FACT, February 5, 2016. El Museo is a 501(c)3 nonprofit, professionally directed visual arts organization dedicated to the exhibition of contemporary work by underserved artists, and cultural programming that engages diverse communities through the arts and humanities. In the 1970s, following the civil rights movement and a renewed emphasis on diversity politics and multiculturalism, cultural organizations proliferated working to represent minority groups and recognize their contributions to our common heritage. It was in this spirit that a group of young Latino artists primarily associated with the University at Buffalo formed the Latino Artists Collective in 1977 to promote Latino/a, Latin American, and Caribbean fine art in the region. Without a permanent home, the collective became known for street corner drama, poetry, and literary readings. Meanwhile, visual artists in the group started a program called Gallery Without Walls, staging temporary art exhibitions in various locations on the West Side of Buffalo. In 1981, this program formalized to become El Museo Francisco Oller y Diego Rivera, honoring two of the most esteemed Puerto Rican and Mexican artists, respectively. Since then, we have expanded our mission to include all underserved groups including people of African, Latino/a, Asian, Arab, and Native American descent, women artists, and our region’s growing population of immigrants and refugees. In 1997 we moved into our current space on Allen Street and have since presented numerous exhibitions and public programs promoting diversity and inclusion, dialogue, and excellence in the arts and humanities. Over the years, many organizations like us have come and gone due to funding cuts, lack of constituent support, and perhaps a general apathy towards maintaining them. El Museo is Western New York’s only nonprofit visual arts organization dedicated to the exhibition of work by underserved artists, occupying an important position in our region’s longstanding and recently resurgent arts and cultural scene. We are proud to have been a lasting presence in our community, as a space where one may encounter the other through art, where artists can interface with the public and challenge us to widen our horizons.